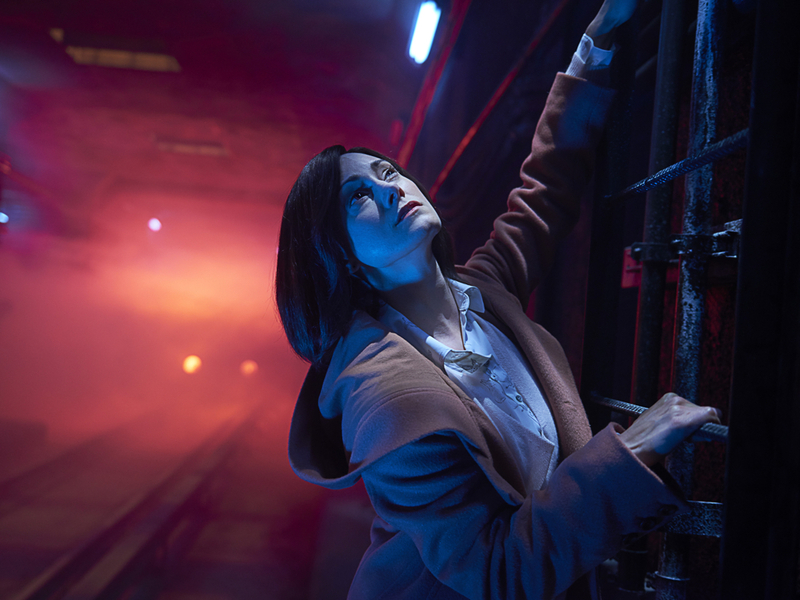 To prepare for the upcoming third season of FX’s The Strain, Natalie Brown gave up solid food—and it wasn’t pretty. Brown stars as Kelly Goodweather, a vampire who wants to turn her beloved son, Zach, so they can be together. But she’s been ordered to keep him human, and close. The Master of the strigoi—the show’s version of parasitic vampires—has plans for Zach. Kelly’s unfulfilled desire to be with her son led the Canadian actress to try a juice fast at the beginning of filming. It was an interesting experiment to see if she could practice the same restraint her character is forced to use. I spoke with Brown earlier this summer about her juice cleanse, why Kelly and Zach remain so connected, and whether The Master’s plans for Zach will cause friction with Kelly. Season 3 of “The Strain” premieres at 9 p.m. Aug. 28 on FX. Kelly, at the end of last season, finally got what she wanted, which was to get Zach back. Now what’s going to happen? Be careful what you wish for. Yeah. I’m not even sure if the Stones song applies: “You can’t get what you want, but you get what you need.” Kelly desperately needs to turn Zach, but The Master has his own plans, so it’s a delicate balance for Kelly to still carry out The Master’s bidding while trying to be true to herself. There are some interesting challenges in Season 3 for Kelly. What I will say is that Season 3 is an extreme lesson in restraint. For her. Other people might not hold back, but Kelly certainly has to. There are some great moments between you and Max Charles, who plays Zach. My thought all along has been how hard is it for her not to feed on him. You have a scene where her tongue comes out. She really has to fight an urge it appears. I did a juice cleanse before beginning Season 3. … I found that it wasn’t so much hunger but a yearning that I had never experienced. You drink so many juices all day, but you really, really miss the feeling of food and chewing. Kelly always has that constant yearning and hunger for something that she can’t have. I thought, “Let me try this on set one more time.” I wouldn’t advise it. What went wrong, as if I need to ask? It’s just desperately wanting something that you can’t have. In this day of instant gratification, we’re so fortunate to be able to have so many things available to us at all times. We can have it with the tap of a card. Yeah, this was an interesting lesson in really mastering the art of restraint and discipline for a higher purpose, whatever that is. For me, it was just discipline and self-control. The other comparison is with practicing yoga in my life. Sometimes a yoga teacher or an instructor might be guiding your body to do things you might not want it do. The Master guides Kelly in the same way. Although you have your own thoughts and your distractions, but this guiding voice still gently nudges you in the right direction of this thing you should be doing. That was where I drew comparisons in my own life. If The Master were to be killed, would his control over Kelly and the other Strigoi be severed enough that she might turn Zach? [Laughs.] The likelihood is high, hypothetically, because the only thing preventing her from turning him is The Master. That tether that he has is what’s keeping her from doing what they are now biologically programmed to do, which is charm their beloved. There is nothing she wants more in this new life than to turn Zach to connect with her son. … She sees him as a weak human who’s in a vulnerable state. Being turned is a thing of great beauty, and if she was allowed to do that, in her mind she would save him. She would be offering him eternal life. They’d be part of the new world order as Eichhorst says. He wouldn’t have his asthma anymore. He wouldn’t have his asthma. Eichhorst wouldn’t have to keep making him grilled cheese. The food supply is running short. Things are very simplified when you become a Strigoi. Life is very simple. As long as you don’t run out of humans. As long as you don’t run out of humans. You definitely need a plan for that. Was it nice this year to skip the Strigoi makeup? Kelly is mostly human looking. I actually missed it. I’m not going to lie. I’ve always said how much I love the makeup process. I not only love the artists that I get to work with, but it really informs the character. After four-and-a-half hours of prosthetics and hair and teeth and contacts are in, you are Kelly, or I was. I had to do very little to feel awfully menacing. Whereas I felt it was a bit more of a challenge to embody that the more “human” Kelly is. Max Charles, God bless him, he’s such a patient and lovely actor, but I just, in so many scenes, I’m just staring longingly at his face and unnerving him in so many ways. He never flinched. Of course between takes we have a lot of levity and jokes. Especially with Richard Sammel; the darker his scenes are the sillier he is between takes. I don’t know if you got to see the panel. I think he talked a little bit about that. He was funny in interviews, too. He’s just so joyful. I don’t know many actors who are quite that joyful, especially playing characters that dark. He is just such a true artist in every sense of the word. The things in his own life that he brings to the character, and just how passionately he plays Eichhorst, but also the joy that he brings to the character. As soon as they yell “cut,” he might be one of the silliest but best dancers between takes. It’s sometimes harder for the rest of us to stay focused because we’re just not perhaps quite as gifted as Richard Sammel. He can just drop right back in. We had a lot of fun in Zach’s bedroom this season—in the most congenial, platonic way possible. In your scenes with Max, there are some really great poignant moments. He helps you with your hair in one. I thought you guys did a great job. It’s just trying to find a new way to reconnect in this strange new dynamic of mother and son and for both of us. For Zach to try to find a way to reconnect with his mother. He longed to be reunited with his mother as much as Kelly wanted to be reunited with Zach—for different reasons, of course. Just trying to find a way to find a new normal. It was an interesting journey. All along I’ve been going, “Why is this kid so determined to get back to his mom when he knows what she is?” Logic would have him be frightened of her and run away. I remember last year at Comic-Con you talked about this bond between them that was unbreakable. She actually puts that to words when she remembers his birth as a caul baby. Yeah, that was such a great scene. The prosthetic department just blew my mind because they had built a robotic baby inside of an amniotic sack, which is what the caul baby is. The mythology behind a caul baby is really interesting. Babies born with partial caul is a bit more common, but for a baby to be born in full caul is extremely rare. There are some notions that they are born with special gifts. The Dalai Lama must be born a caul baby. Some folklore suggests that caul babies become vampires in the afterlife, which is why I believe Guillermo had that in the books. There’s some great backstory for Kelly in the books where part of that bond comes from the birth itself being so difficult. But also she’d suffered many miscarriages and all she ever wanted was a child. It was such a difficult journey for her and Eph to get there. When she finally did it was such a risky pregnancy. For him to be born was just so special that that special attachment, and that unbreakable bond they’ll always have. It transcends from life into the afterlife even when she’s turned, so I think that really translates this season. There’s a nice parallel with Gus and his mom this season. Isn’t there? There really is. Same thing—even if mom’s a monster, you’re not going to give up on your mother. Did you have to do a lot of voice work playing her as sentient? Because you hear it very layered, correct? It’s a great process that the sound designers came up with where I, of course, record everything normally on the day. When we go back in the studio to ADR, they have me redo all of Kelly’s lines in a whisper and in a grovel and in a louder voice. Then they layer it. The effect is, I think, quite mesmerizing. It is! So you had to match yourself from your original recording? Yeah, and the good thing about doing a lot of television is I’ve clocked hundreds of hours of ADR. ADR is when you have to go in, if the sound was bad on the day or a train goes by, you have to go and rerecord it. I always say it’s like a bad game show with no door prize. You have to sync your lips perfectly, but then you also have to match the emotion, so usually it takes several stabs at trying to sync everything. Then you have to match the emotion or sometimes perfect something if something was wrong on the day. I’ve become really, really good at it. I actually quite enjoy it, to do that for Kelly, and I have to redo every line of dialogue. I also know that it’s forgiving. If I didn’t get something quite right on the day, we’ll have a chance to make it better later. That’s the thing about last season. I feel like so much of the work of Kelly was done for me by the hair and makeup team. It was done again by the sound department. Then, the Feelers did my dirty work, so Kelly had a really easy ride in Season 2, and she definitely has her work cut out for her in Season 3.